This weekend was kind of a whirlwind as I decided to go to Rhode Island on Saturday afternoon last minute to spend the night with Pat's family. Once I got there it was the opposite of beach weather but we went to the Matunuck Oyster Bar anyways, where I stood dangerously close to a bonfire to stay warm and then had a seriously gigantic bowl of the most amazing mussels. My clothes smell like campfire now but the feeling of being near the beach again makes it worth it. I'm a firm believer that there should be another month in between May and June. How can the summer already be creeping up so fast? Not that I don't want it to come - I am just afraid I will blink and it will be over! Everything is in bloom right now and I am trying to spend as much time outside as possible. Getting out of work when it's still light out really makes all the difference. I've also been hoarding cookbooks lately and one of my favorites is Sweeter Off the Vine by Yossy Arefi, at Apt2BBakingCo. It is so beautiful and is full of so many delicious recipes that use fruit in ways I would never normally think of. As summer approaches I'm getting excited to make a bunch of her recipes with fresh fruit from the farmer's market. Pre-voyaging to Rhode Island I got a head start and made the Rhubarb and Rose Galette in the book. Rhubarb is one of my favorite summer ingredients. When I was little my family had a rhubarb plant in the front yard and I remember my parents cutting off stalks to make pies and jams. I love how it's tart and tangy with just the right amount of sweetness. Slice the rhubarb lengthwise and then slice each piece into 3" sections to make skinny batons. Set aside. In a medium bowl, add vanilla, lemon juice, sugar, flour, salt and mix. Add rhubarb sticks so they are coated. Add in 2 teaspoons of rose water and lemon zest and toss together lightly. Cut pie dough sheets into squares about 4"x5"and transfer to baking sheets lined with parchment paper. 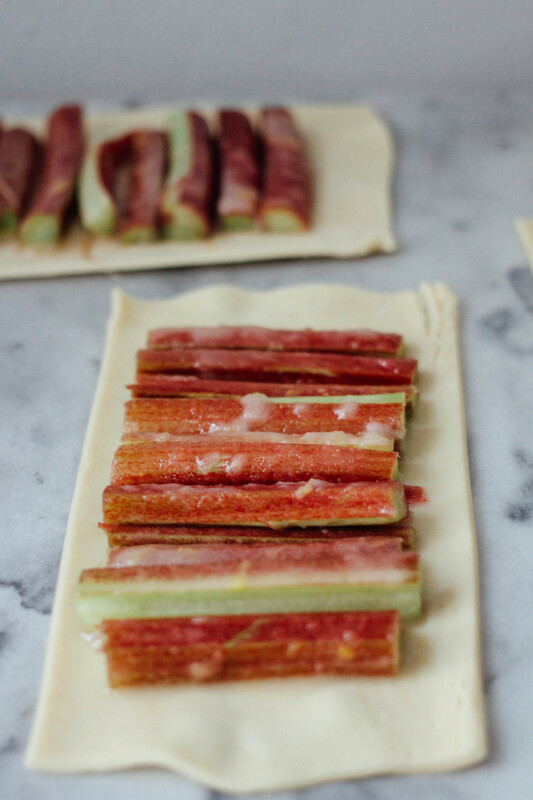 Arrange rhubarb sticks in a line in the middle of the pie dough squares so that they are overlapping. Leave about 1/2" of space on all sides of the pie dough. Fold the edges of the dough up so that they are over the rhubarb and seal with your fingers. Put the baking sheets with the galettes in the freezer for 15 minutes. While they are in the freezer, preheat the over to 425 degrees F.
Remove galettes from freezer and brush the crust with egg wash. Sprinkle each galette with turbinado sugar. Add some juice from the rhubarb/sugar mixture. Bake galettes in the oven for 30-40 minutes, rotating halfway through. Make the rose cream by mixing heavy cream, 1 teaspoon of rose water, 2 teaspoons of sugar with a beater until soft peaks form. Let the galettes cool slightly and top with whipped cream.